What you’re looking at here is the jury from the inquest into the deaths of Princess Diana and Dodi Al Fayed, as they walk into the underpass where the accident took place. The crash occurred in Paris on 31 August 1997, but the inquest took place more than a decade later, in October 2007. The 11 jurors had been flown to Paris to retrace the footsteps of Diana and Dodi that fateful night. This was the moment they headed towards the Alma tunnel, where they were shown the entrance and the place where the car crashed. A small number of press photographers were granted permission to follow the jurors and other personnel in two coaches. I was one of the accredited photographers for the event. There was such huge press interest in Diana that the authorities wanted to control the media situation as much as possible so it didn’t turn into a massive circus in the centre of Paris. People were going about their daily business – the city wasn’t at a standstill at all. The area was briefly cordoned off, but it was soon re-opened. 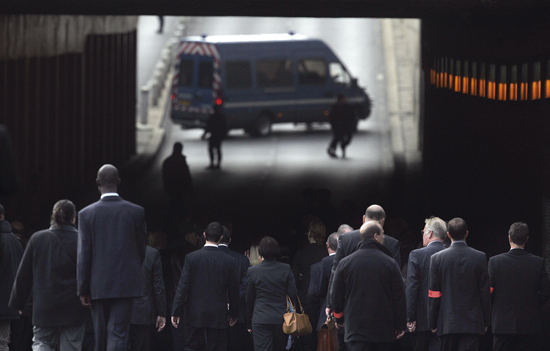 The jurors are walking away from the camera and you can only see their backs as they head towards the dark tunnel. There is a feeling of doom in the picture and I was trying to convey the sombre and solemn mood and the atmosphere at the time. I wanted to portray a sense of what was happening and what might happen next. Although this shot was taken many years after the accident, it was as if the figures are walking down into the scene all those years ago. Photographing the people from behind has been quite effective here. The viewer is privy to the scene and almost becomes a member of the jury. Part of my intention was to give the viewers who weren’t there a sense of what it might have been like had they been walking with the jury. There was another reason why I photographed the people from behind. If I remember correctly, the people with the red armbands were members of the jury and they couldn’t be identified. The biggest challenge was trying to make the image interesting. Because the accident had happened many years before, there was nothing to show what had taken place there. My viewpoint is slightly raised, but this was the natural incline of the road. I was using my Canon EOS-1D Mark II. I used a long lens for this image (although I can’t remember exactly which one) to compress the tunnel and the people in the foreground. I needed to bring them together before they reached the entrance of the tunnel because if they had reached the entrance, they would have been in darkness and it would have been difficult to get a good exposure. As I recall, the light was quite flat and even. I took many other pictures on the day, but for me this image told the story best. I took some photographs inside the tunnel of the actual pillar that the car collided with, but the images didn’t have the same atmosphere. I didn’t need to photograph the actual pillar with the indent in it to tell the story – it didn’t relay the story any better than this image taken from outside. You don’t always have to photograph the most obvious thing to tell a story. You may find that you can relate the story through other pictures that are less obvious. It’s a case of thinking about what you’re trying to convey. I was aware of the importance of this event from a news and historical point of view – you can’t not be aware of the media attention of an event like this. In fact, I wouldn’t be doing my job if I weren’t aware of it. Even though there was huge interest in what was going on, I like to think I treat any situation with the same respect, regardless of how high profile the story or person involved is. Everybody deserves the same degree of respect.